Oxygen is necessary to facilitate the many processes continually occurring in living organisms. When oxygen interacts with other substances in the body, it creates the breakdown of such substances, a process called oxidation. This is a normal and necessary biological process. During this process, free radicals are created when molecules lose hydrogen and electrons causing molecular instability. These unstable molecules, with their lost electrons, seek to obtain a replacement electron from a stable molecule and in doing so, create a new unstable molecule. It is these unstable molecules seeking to become stable that are called free radicals. This process of molecules losing and seeking electrons can lead to billions of free radicals roaming around in the body at any given moment. While free radicals are used by the body’s immune system to destroy pathogens, it is when the creation of these unstable molecules becomes excessive that free radicals are very damaging to the body. Free radical damage creates inflammation and inflammation is at the heart of most disease. Antioxidants are substances that neutralize free radicals. The body produces a number of antioxidant enzymes that neutralize free radicals and our diet supplies nutrients such as vitamin C and E that do the same. The most abundant and powerful antioxidant produced by the body is glutathione (GSH). Not only does GSH function as an antioxidant, it also rids the body of toxins, inactivates pathogens and performs a number of other metabolic functions such as transporting amino acids into our cells and recycling vitamins C and E so these nutrients can better protect us from free radical damage. The liver is very dependent on GSH for detoxification. The effectiveness of our immune system is dependent on GSH which includes increasing the activity of natural killer (NK) cells which are know to fight cancer. Research indicates that when levels of GSH decrease in the body, the incidence of disease increases. GSH is made in the liver from the three amino acids glycine, cysteine, and glutamate. GSH is found in every cell of the body and without it cells cannot survive. As stated above, the oxidative process results in the loss of hydrogen and electrons which leads to the production of free radicals. GSH reverses this process by a reduction reaction that provides hydrogen and electrons so that free radicals become neutralized. In the process of doing this, GSH itself becomes oxidized and must be returned to its reduced state by the enzyme glutathione reductase. Healthy cells will have around 90% of its GSH in the reduced state and 10% in an oxidized state at any given time. The ratio of reduced GSH to oxidized GSH is a measurement of overall health. As we age, GSH levels fall as our bodies are not able to produce GSH at the same level as when we were younger. By the time we are in our 60’s our GSH levels can be half of what they were when we were in our teens. If we are experiencing health problems, our GSH levels take a hit because the body must use greater amounts of GSH to fight disease. Since the body’s production of GSH decreases with age and health problems place a greater demand on available GSH, it may be advisable to take GSH supplementally to increase its presence in the body? A small human study conducted in 1992 indicated orally supplemented GSH did not remain bio-available because it was oxidized in the digestive process. Therefore, taking GSH orally could potentially increase the oxidative load in the body rather than reducing it. However, animal studies have showed that orally administered glutathione is bio- available and will enhance tissue GSH levels. A recent human clinical trial conduced at Penn State Medical School and published in the European Journal of Nutrition showed that orally taken GSH can be beneficial. Fifty-four healthy adults ranging in age from twenty-eight to seventy-two were divided into two groups with both groups taking an oral glutathione supplement. One group took 250 mg/day and the other group took 1,000 mg/day. They ran the trial for 6 months to determine the before and after GSH readings and immune system marker differences. After three months, the high dose group showed improvement in natural killer cell (NK) activity and after six months overall GSH had increased 35% in the high dose group. The low dose group also experienced increases in GSH but at a lower percentage. After being off the oral GSH supplement for a month, levels of GSH returned to pre-supplementation levels. This study indicates that orally taken GSH increases GSH levels in the blood but must be taken on a regular basis for such levels to be maintained. Some doctors administer GSH intravenously. This bypasses digestion by getting GSH directly into the blood stream. However, this is a rather expensive way to supplement with GSH. Some use the amino acid N-acetyl-cysteine (NAC) to enhance GSH production. As stated above, GSH is a combination of the amino acids glycine, cysteine, and glutamate. While glycine and glutamate are generally plentiful, cysteine is not. Supplementing with cysteine can help the body to produce more GSH. NAC is used instead of just plain cysteine because it is better absorbed. In the body it converts to the amino acid cysteine. It is the sulfur from this amino acid that is used by GSH to detoxify the body of heavy metals such as mercury, lead and arsenic. The success of this approach is based on the body’s ability to adequately make GSH, an ability that decreases with age. In an attempt to eliminate the potential oxidation of orally taken GSH, some companies are using very small fat balls called liposomes. GSH is injected onto the interior of these fat balls. Since these fat balls are made from phospholipids that are virtually identical to the phospholipids that make up our cell membranes, they are easily taken into our cells and carry the “hidden” GSH with them. Liposomes appear to not be digested but travel directly into cells via the blood stream. Another way to circumvent having GSH pass through the digestive process is to take GSH as a sub-lingual. French scientists have developed a GSH tablet that slowly dissolves under the tongue. The tissue under the tongue has many capillaries which absorb GSH as the tablet dissolves. Under this method, the GSH does not get digested but passes directly into the blood stream. In human studies, this method has been shown to significantly raise GSH levels. This method avoids the possible risk of having orally supplemented GSH oxidized in the digestive process. At Milk ‘N Honey we carry a product called Clinical Glutathione which uses this method developed by the French. 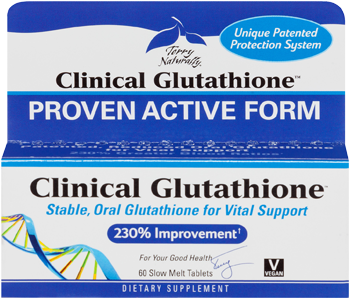 Glutathione is a critical element that every cell of the body must have in order to survive. It may be prudent to do all one can to maintain sufficient glutathione levels.